How can I reuse or recycle excess sterilising solution? | How can I recycle this? How can I reuse or recycle excess sterilising solution? We’ve covered a wide range of things during our cleaning themed week here on Recycle This – bleach bottles, plug-in air fresheners, making dishcloth & pot scrubbers, and yesterday’s very interesting discussion on reducing plastic waste from cleaning – so I feel it’s fine for me to go off on a bit more of a tangent for this last one: sterilising fluid. Anyway, when he’s doing some homebrew, John mixes up a big vat of the sterilising fluid and uses it to sterilise this things – but since they’re hot-water-clean already, the liquid doesn’t get too messed up. I’d imagine people sterilising babies bottles would be in a similar position. It apparently has an effective life of about 24 hours so we can reuse it for other things – but what? According to this forum on MoneySavingExpert, it’s a good halfway house for bleach – you can use it as a safer bleach for cleaning places you wouldn’t want to use full strength bleach (the microwave, tea cups, camping water bottles). Does anyone have any other suggestions for things to do with it? I know some people use a weak bleach solution for cleaning plant pots before sowing seeds/delicate seedlings in them – would this be suitable for that? I am a home brewer in the states. I use bleach for sterilizing. I keep a rubbermaid tote filled with bleach and keep my non-metal pieces in there after a hot water cleaning. When ready to use again, I rinse with hot to warm water. For the fermenting vessels, I keep a pail filled with the bleach solution, then transfer it into the vessel for thirty minutes. Put back into the pail, rinse the vessel (with warm to hot water) and continue on my way. I can keep the bleach water clean and stable for months. 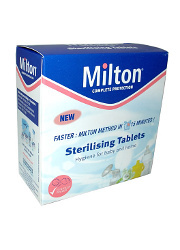 I used to use the Milton tablet solution for baby bottles and then use the excess for cleaning the bathroom and the vinyl floors. It’s still good for lots of mild cleaning jobs. Can also use in the laundry to give the dishcloths or hankies an overnight soak. I imagine it would be good for coffee cup stains -just don’t leave on bench in a mug least someone unwittingly drinks it!